Down here in sunny Florida we're all voicing a big woo-hoo as the summer is nearing an end. At least according to the calendar. Summers can be brutally humid and even though our tropical plants must have the warm, muggy, moisture to thrive, so many annuals and perennials are just not suited for the extreme heat we experience day and night. Not to mention the humans that must continue to toil and tend the gardens as the plant life becomes a miniature jungle in July and August. September is not typically the supreme month for showy gardens in this area. Summer's intense and yet very erratic conditions with sometimes rain and sometimes none takes its toll on so many living things. Working in this environment for so many years has taught me a few things about my particular garden. One of them I am endeavoring to master is how to make the garden last into September. There was a time when so much of the garden had faded away with the sunshine as August turned the corner to the remaining days of summer. It's no secret Hoe and Shovel is enamored with and dependent upon caladiums. As a tribute to their stamina and stalwart habits in this sometimes difficult Florida climate let's have another look around at all their loveliness at this point in the season. Caladiums in all their unique forms, varying heights, diversity of color make for an enduring display, as the long hours of daylight shorten turning into autumn... be it ever so gradually in this part of the county. ... blending in with the existing vignettes that supply the main interest all seasons of the year. Planted tightly and closely together in each bed, as they begin to fade and wilt, the farewell to them for the season isn't so noticeable at first. Their hardy show won't be perking up the garden but for a few more weeks. Which is why I'm still snapping away to capture each stage of their 4-5 month life. We'll leave them in the ground when there's no more bloom and hope not to disturb the bulbs as we fill in the gaps they leave with other plants for the next season. 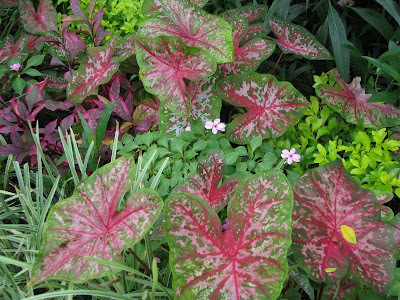 It's been a happy 'caladium summer' and I never want to say farewell to these favorite standards of my garden but one good thing to look forward to once they are gone is some cooler weather. Life is all about trade offs isn't it? Hi Meems, I just love your caladiums. I will have some next year. I just can't put them out as soon as you can of course. Just seeing yours mamkes me want some of each. Hey Meems, I glad I stumbled upon your blog. It looks great and your pictures look fantastic! My mother-in-law planted some caladiums for the first time this year and they really made her landscape stand out. I'll have to find a spot for some of my own next year. Meems, I love to tour your caladium plantings. Each bed is prettier than the last. I can only marbel at the work it took to get them all planted. My pitiful few bulbs have done well for me after thinking they were not going to come up. These I palnted in containers and am goingto try to dig them up and over winter them. Next year, I paln on putting some into the ground to use as accents-like yours. You have inspired me! Ah yes, the tried and true Caladiums..I love them as well. 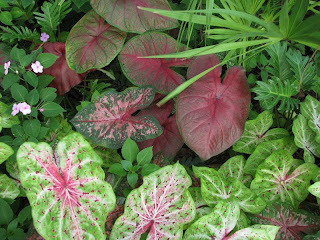 Nice mixture of plants..
i wish i had something like a caladium that i knew i could count on till fall. i love "the tribute to their stamina and stalwart habits" . how nice for you you have this special plant to keep you blooming. That colorful foliage is as beautiful as any flower. I always think I should get some but then I think about the digging and storing and replanting we have to do up here. Lisa: Yes, you must get some next year and definitely put some in your pretty window box. hap: Thank you and welcome to Hoe & Shovel... the great thing about caladiums is you can "make room" in just about any existing setting. Beckie: It is a bit of a chore getting them in the ground initially. It's worth noting that many of them return each year and then I always add to them around May/June for added fullness. But once they are in the ground ... they are virtually maintenance free. I do hope your over wintering works for you. Thanks for coming along on the tour. darla: Tried and true is a good description... aren't they the easiest foliage for not much fuss? marmee: It is sure to be the case as you expand your garden and find the plants you love for your fabulous farmhouse and acres. Every garden is different and every garden as it matures has its stalwart standards! Your garden is still looking pretty gorgeous Meems. 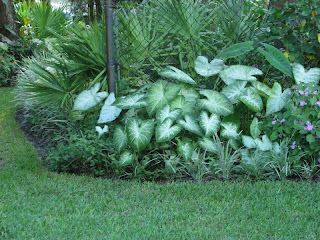 I love the tropical flavor the caladiums give your beds. Every picture was incredibly impressive..you've designed the beds to really show off those beautiful leaves well! 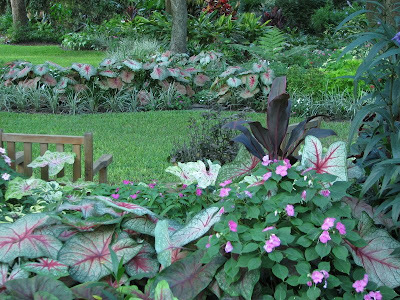 Meems, your caladiums and tropical looking garden are beautiful. I'm giving a big whoo-hoo too as summer grinds to an end and upcoming cooler weather will make gardening a pleasure again. perennial gardener: Thanks so much... 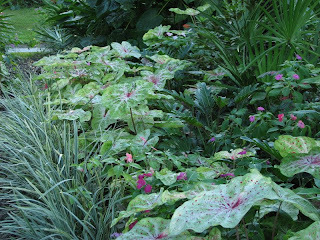 I agree caladiums do lend toward the tropical flair I'm continually searching to achieve... but I think it helps to plant them in mass for that look don't you? leslie: I'm glad you liked the photos... having these varied colored leaves makes for easy designing. Pam: I'm hearing your woo-hoo across the Gulf... right now it's hard to remember humid-free gardening but I know it will come again and all the world will be set aright again! Meems, your caladiums are lovely as is you whole garden. What triggers them to go dormant for the winter? I wouldn't have thought that you have a great difference between your summer and winter day light hours or have I got it all wrong! I have never tried growing caladiums, I am not even sure I could buy any here, I think this year would have been too dull and cold for them. But I am always curious. 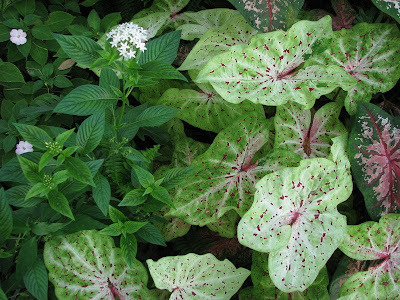 I have a few caladiums here and there but mass plantings are definitely the way to go with these. Beautiful! It's hard to know exactly how to feel as our much tended gardens go to sleep and leave us with more enjoyable conditions. Your garden was especially pretty this year. I'm sure it was those gazillion bulbs you put in and all that yummy mulching, soil preparation, and tender care. If you get bored, you can come up to NC and help me get some clay soil ready for next year's spring planting;)Bring you pic axe! You've helped me appreciate caladiums; before they were just container plants that needed too much water! They are incredible in your beds. They do pop and add a colorful dimension to your garden. They have color, interesting leaf shape and texture...like Marmee, I wish we had such a plant for our gardens. Sylvia: Caladiums thrive in the warm moist soil and as the days get a little shorter and the soil starts to change temperature ... I'm thinking that must be the trigger... I've never really thought about that. Yes, we actually do have much shorter days in the winter. 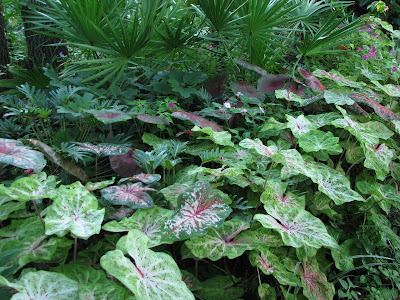 You are probably right about caladiums preferring a sunnier more humid climate. dee: thank you. I am looking forward with great anticipation any kind of break in the summer pattern. greenjeans: I order mine from caladiumworld.com... they have great service and very good quality bulbs. When I first got started planting in mass I started in one area and moved around the garden to expand. You will love how easy they are to maintain. anna: you are too funny... I don't think I've ever been bored as there is always gardening to do here. But if I ever do I'll remember my pick axe. 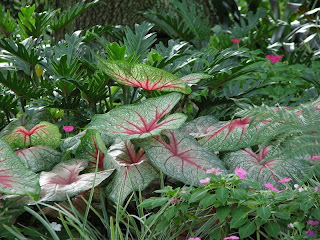 gail: I have lots of containers with caladiums packed in and most times next to other water loving plants... so I know what you mean about them needing lots of water. I would have to say I think your susans are like my caladiums adding so much spark and fervor to your woodlands in summer. As usual,your garden is looking lovely. 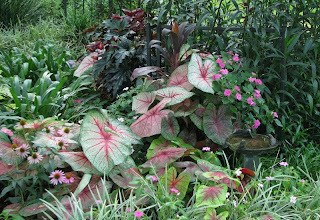 The caladiums really lead your eye along the beds. Their bold shape and intricate patterns are very pleasing, giving substance to the border. 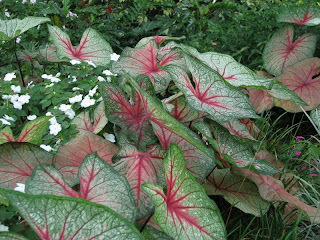 You are fortunate to have another green season following after caladium season. My caladiums are still looking lovely here, although they seldom get as large as yours. I've always loved them, in fact, caladiums were one of the very first flowers I grew when I got married and had a home of my own. Unfortunately, I have to dig them and store them for the winter.